With it’s glass-like finish and precision edging Acrylic is the premium product for displaying photos and art prints in the home, or for commercial signage where a contemporary look is required office reception signs. Get the Luxury look of acrylic without the price tag. 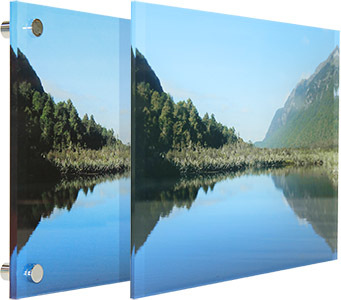 The same gallery grade print seen through an acrylic glass surface on a 3mm acrylic with velcro button wall mounts allowing it to be removable and replaceable. 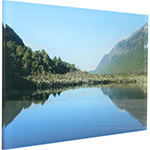 For the ultimate in contemporary wall art we print at gallery grade seen through a substantial 5mm thick clear acrylic for maximum rigidity, giving a luxury glass-like finish with satin polished edges. Supplied with Chrome Fixing Studs. For the ultimate in contemporary wall art we print at gallery grade seen through a substantial 5mm thick clear acrylic for maximum rigidity, giving a luxury glass-like finish with satin polished edges. Supplied with our invisible wall mounting kit. With the appearance of a solid block at this extreme thickness, Supersize Print offers the ultimate in contemporary wall art. We print at gallery grade seen through a 10mm thick clear acrylic, giving a luxury glass-like finish with satin polished edges. Supplied with Chrome Fixing Studs. With the appearance of a solid block at this extreme thickness, Supersize Print offers the ultimate in contemporary wall art. We print at gallery grade seen through a 10mm thick clear acrylic, giving a luxury glass-like finish with satin polished edges. Supplied with our invisible wall mounting kit.